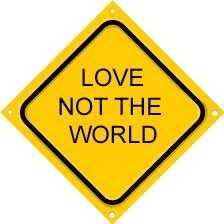 “15 Love not the world, neither the things that are in the world. If any man love the world, the love of the Father is not in him.16 For all that is in the world, the lust of the flesh, and the lust of the eyes, and the pride of life, is not of the Father, but is of the world. 17 And the world passes away, and the lust thereof: but he that does the will of God abides for ever.” 1 John 2:15-17. The carnal mind is at enmity with God. The Believer cannot love the world and love the Father…it is simply not possible. The pride of life and lust of the flesh is of the world and will soon pass away. Lay not up your treasures on earth. 21 For where your treasure is, there will your heart be also.” Matthew 6:19-21. The fruit of the Will of God in the Believer’s life is seen, not heard. The Gospel of Jesus Christ is heard, faith is put into action by belief in God’s Redemption Plan (Jesus Christ and Him crucified) and fruit is seen. Sadly, much of the modern church attempts to “show” the Gospel of Jesus Christ by passing out water bottles, etc.. This not declaring the Gospel of Jesus. Faith comes by hearing and hearing by the Word of God. Whether the hearer believes or not is up to them. If the Christianity which is professed by many does not result in an inward change, in a new man in Christ Jesus, then that which is professed in not possessed. “11 But you, O man of God, flee these things; and follow after righteousness, godliness, faith, love, patience, meekness. 12 Fight the good fight of faith, lay hold on eternal life, whereunto you are also called, and have professed a good profession before many witnesses.” 1 Timothy 6:11-12. The effective work of the Cross of Christ in a Believer’s life for dominion over sin is made of no effect when our faith is directed to the ways of the world, schemes of man or religious traditions and ceremonies. We are not free from the law of sin and death when our faith is in 40 days, 12 steps or 100 ways (Romans 8:2). The power of God is the Cross of Christ. Any other gospel is accursed and makes the Cross of Christ of none effect in the Believers life for dominion over sin. Recognize the fruit of the other gospels. They will always lead to another source (self) and another means(self effort) for the dominion over sin. Follow after righteousness, godliness, faith, love, patience and meekness…follow after Jesus Christ. “23 And He (Jesus) said to them all, If any man will come after Me, let him deny himself, and take up his cross daily, and follow Me. 24 For whosoever will save his life shall lose it: but whosoever will lose his life for My sake, the same shall save it.” Luke 9:23-24. We cannot follow Jesus Christ without first denying ourselves, denying the lust of our eyes and the pride of life. Submit to God. Follow Jesus Christ.